As Russian philosopher Nicholas Roerich passed through the mountains of Central Asia in 1926, he and his guides were left fascinated when they witnessed an incredible, golden orb floating in the sky. “…High up in the cloudless sky, they clearly saw a golden spheroidal object moving from the Altai Mountains to the north at tremendous speed. Veering sharply to the south-west, the golden sphere disappeared rapidly beyond the Humboldt Mountains.” – Chapter 4 of Invisible Eagle: The History of Nazi Occultism by Alan Baker. While in modern times many people have come up with a number of theories about the possibility that the Earth is hollow, in time immemorial, many cultures believed the same thing. Descriptions of the Hollow Earth, Inner Earth and a world inside our own planet can be found in numerous ancient cultures around the globe. What if Jules Verne’s classic “A Journey to the Center of the Earth” is actually true? What if somewhere down there, a new world is waiting to be explored, a place where somehow, living beings inhabit the depths of our planet, a place that ancient cultures and civilizations knew existed, or still exists today. What if, it’s actually true? In fact, you’d be surprised to see how many ancient cultures and religions mention the existence of the world inside our planet. Interestingly, the Babylonian hero Gilgamesh visited his ancestor Utnapishtim in the bowels of the earth. In Greek mythology, Orpheus tries to rescue Eurydice from the underground hell. It was believed that the Pharaohs of Egypt communicated with the underworld, which could be accessed via secret tunnels hidden in the pyramids. Is there a world inside our “world”? Legends from the Macuxi people suggest that those who enter the mysterious cavern travel for three days, only descending giant stairs, which measure around 33” each step. 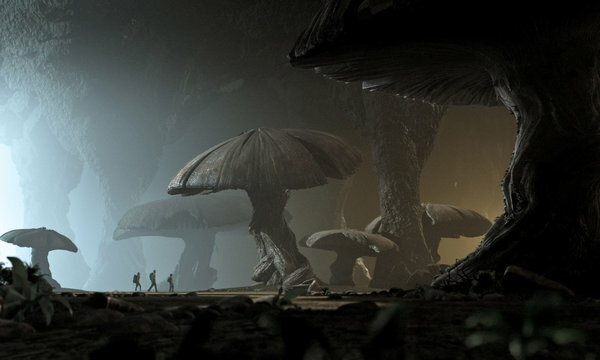 After the third day, they leave behind their torches and continue their journey “into” the Earth, illuminated by lights that were already present in the caves. Giant lanterns, the size of a watermelon and shining brightly as the sun. Buddhists believed (and still believe) that millions of people live in Agharta, an underground paradise ruled by the king of the world. As you can see, there are numerous oral legends and ancient texts that not only speak of the hollow Earth but about mythical lands that exist on our planet. In fact, many ancient texts can be traced back to a number of different ancient traditions that mention the existence of beings from ‘another’ world that reside WITHIN our own world. One such world is referred to in Tibetan Buddhism and ancient Hindu traditions and is called the Shambhala. Shambhala which is a Sanskrit word which translates to ‘place of peace’ or ‘place of silence’ is mentioned not only in Buddhism but is referred to ni ancient texts like the Kalachakra Tantra and the ancient scriptures of the Zhang Zhung culture. Shambhala is the land of the thousand names. Shambhala is said to be a hidden kingdom that exists inside of our own planet, a magical place which we cannot possibly comprehend and is extremely difficult to find. Spiritual place or physical location? Before Atlantis sank, its spiritually illuminated Initiates, who realized that their land was doomed because it had departed from the Path of Light, withdrew from the ill-fated continent. Carrying with them the sacred and secret doctrine, these Atlanteans established themselves in Egypt, where they became its first divine rulers. Nearly all the great cosmologic myths forming the foundation of the various sacred books of the world are based upon the Atlantean Mystery Rituals. –The Secret Teachings of All Ages: An Encyclopedic Outline of Masonic, Hermetic, Qabbalistic and Rosicrucian Symbolical Philosophy. Modern Theosophical tradition further explains that: Shambhala, however, although no erudite Orientalist has yet succeeded in locating it geographically, is an actual land or district, the seat of the greatest brotherhood of spiritual adepts and their chiefs on earth today. From Shambhala at certain times in the history of the world, or more accurately of our own fifth root-race, come forth the messengers or envoys for spiritual and intellectual work among men. Many people have tried finding Shambala, searching for years all around the planet. Edwin Bernbaum, Ph.D., a lecturer, author and scholar of comparative religion and mythology suggests that Shambhala is in fact round but illustrated as an eight-petalled lotus blossom, which is a symbol of the heart Chakra. Writing in his book the Way To Shambhala, Bernbaum indicates that the way to Shabala is not CLEAR. In fact, Shambhala is a physical place that is said to exist within the human real but is also one that is considered as a spiritual realm, not limited to the physical world. Some might even say it is a supernatural place that even exists within ANOTHER dimension. This article published by Michael Wood, a BBC journalist makes interesting references about Shambhala. Wood describes the kingdom of Shambhala as a lost empire ‘buried’ somewhere in the Himalayas. According to Wood, the inhabitants of Shambhala live in peace and harmony and are faithful to the principles put forth by Buddhism. Shambhala is a place where war, grief and sorrow do not exist. The land of Shambhala lies in a valley. It is only approachable through a ring of snow peaks like the petals of a lotus … At the center is a nine-storey crystal mountain which stands over a sacred lake, and a palace adorned with lapis, coral, gems, and pearls. Shambala is a kingdom where humanity’s wisdom is spared from the destructions and corruptions of time and history, ready to save the world in its hour of need. The prophecy of Shambala states that each of its 32 kings will rule for 100 years. As their reigns pass, conditions in the outside world will deteriorate. Men will become obsessed with war and pursue power for its own sake and materialism will triumph over all spiritual life. Eventually, an evil tyrant will emerge to oppress the earth in a despotic reign of terror. But just when the world seems on the brink of total downfall and destruction, the mists will lift to reveal the icy mountains of Shambala. Then the 32nd king of Shambala, Rudra Cakrin, will lead a mighty army against the tyrant and his supporters and in a last great battle, they will be destroyed and peace restored. –Origins of Shangri-La By Michael Wood. 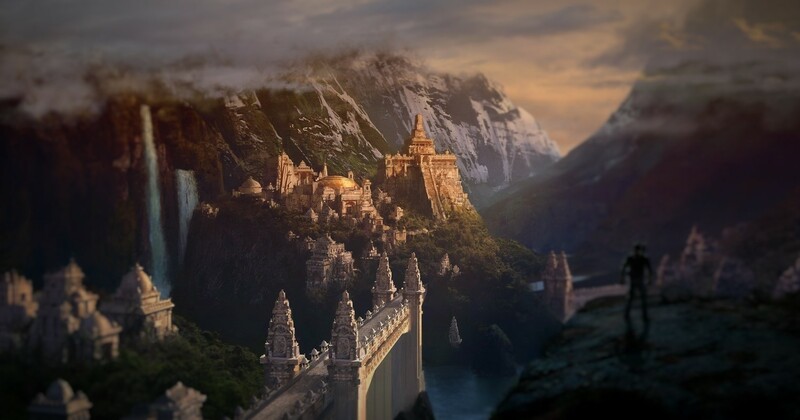 The land of Shambhala: A kingdom of another dimension? But what if Shambhala does in fact exist? What if it isn’t located within our planet but within a different dimension as many authors have proposed? 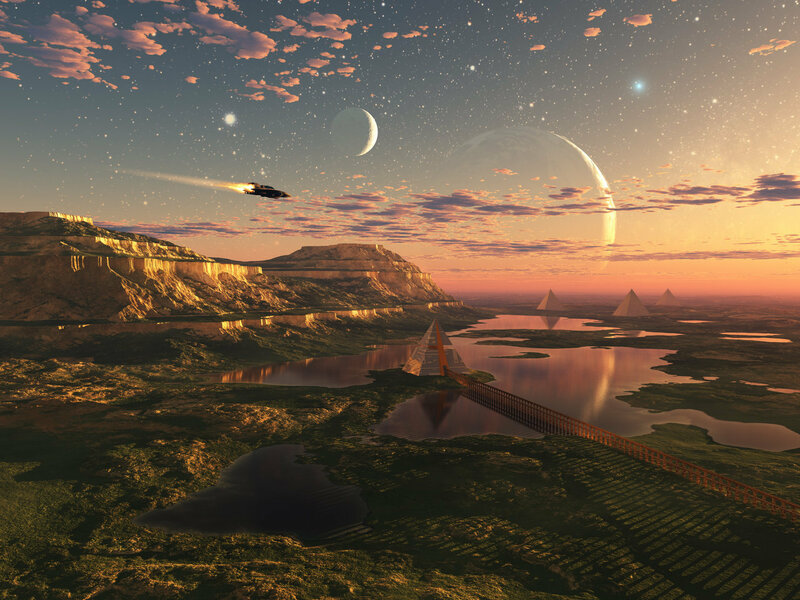 What if we have not been able to find lost lands such as Shambhala and Atlantis because they reside in a different dimension currently unknown to us? Interestingly, there are many ancient cultures which mention doorways and portals to other dimensions. Interestingly, located in modern-day Peru, we find the “Gate of the Gods” at Hayu Marca. Legends speak that in the distant past, great heroes crossed into the land of the gods, enjoying a prosperous and glorious immortal life. According to legend, during the time of the Spanish conquest, an Incan priest called Amaru Muru, from the temple of the seven rays fled from his temple with a sacred golden disk known as “the key to the gods of the seven rays.“ The priest hid in the mountains of Hayu Brand afraid that the Spanish might take the key from him. Later the priest arrived at the “Gate of the Gods” at Hayu Marca, where he showed the key to several priests and shamans of the area. After they had performed a ritual, the door opened with a blue light emanating from it. The priest, Amaru Muru handed the golden disk to one of the shamans and entered the door, he was never seen again. What if Shambala is located in another dimension? And what if all ancient cultures which speak of these ‘mythical’ lands are actually referring to the same place, located within another dimension that we today ar unable to access? Curiously, not far from the Gate of the Gods” at Hayu Marca we come across the Nazca and Palpa lines. There, among hundreds and even thousands of ancient symbols we find one that is both fascinating and mysterious and simply put, should not exist in Peru. Depicted in an extremely remote area, sitting atop an arid mountain plateau, causing confusion among those who have been able to observe it directly is the ancient mandala symbol. The Ancient Hindus were among the first people on the planet to use a Mandala spiritually, but the most famous Mandala most of us know are in fact made by Buddhists. In Ancient Sanskrit, Mandala means ‘circle,’ even though the depiction of the symbol may be dominated by a set of squares or triangles, the mandala as a whole is a concentric creation. Is it possible that the ancient mandala symbol located in the vicinity of the gate of the Gods indicates that thousands of years ago, ancient cultures were aware of the existence of other-dimensional realms like Shambala? And if so, is it possible that the ancient Mandala symbol is the ultimate evidence that supports this theory? Shambhala is ever vigilant in the cause of mankind: he sees all the events of earth in his ‘magic mirror’ and the might of his thought penetrates into far-off lands. Uncountable are the inhabitants of Shambhala. Numerous are the splendid new forces and achievements which are being prepared there for humanity.